I’ve said this before (many times) but I’m going to say it again anyway: I never cease to be amazed by the extraordinary kindness of people in India and the everyday willingness of complete strangers to open their hearts, homes and recipe books to me – particularly in Old Delhi. On Tuesday Dean and I were extremely touched to be invited to an intimate family Navratra celebration. 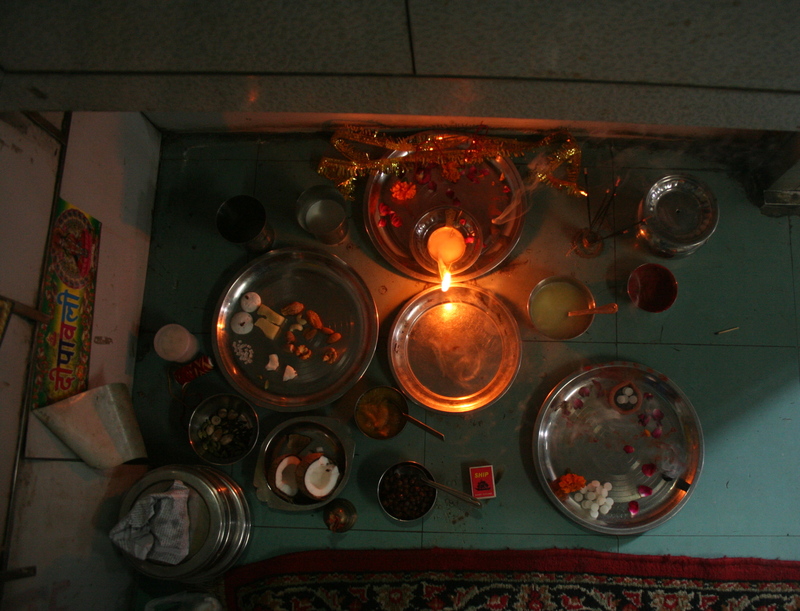 At the home of the Arora family (Amit and his mother Kamlesh) in Old Delhi, a world away from the mayhem of the Durga Puja pandals, we took part in a quiet and dignified Ashtami Puja. Ashtami is celebrated on the 8th day of Navratra and is a moment many families hold a special ceremony to offer prayers to the Mother Goddess or Durga/Kali. For the Aroras, Ashtami is a particularly poignant time because it is a time memories of Amit’s father Ashok (of Ashok and Ashok fame) who died suddenly in 1997, come flooding back. 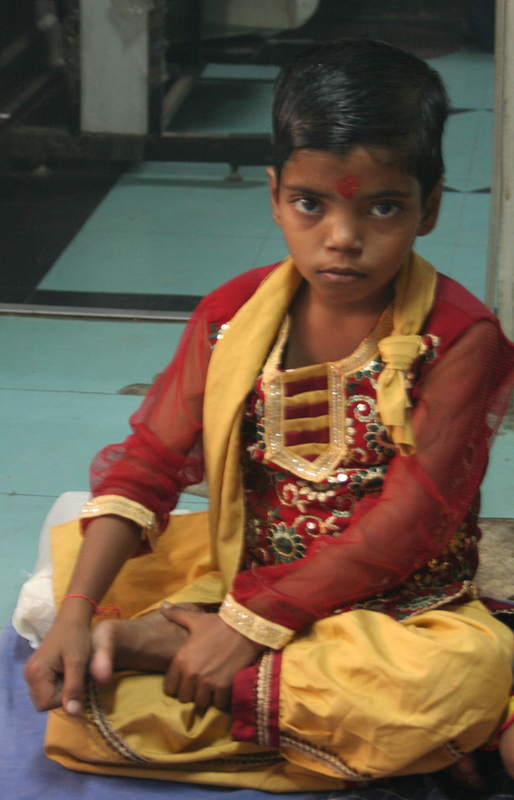 As in Ashok’s day, nine little girls from the neighbourhood are invited in to represent devi, or goddesses. The girls, some as young as 2, all sit perfectly still throughout the proceedings. First, Vijender, from the local temple, lays out offerings for Durga: coconut, almonds, sugar, walnuts, almonds, raisins, burfi and puris topped with chick peas and halwa. 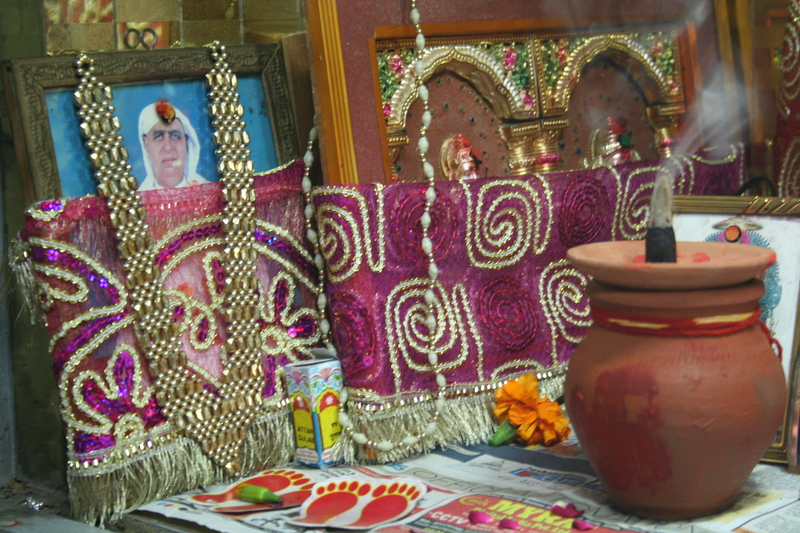 Kamlesh leads the puja, emotional as she remembers her husband, a picture of whom can be seen in the shrine. In his day, Amit tells us later, everyone was invited and his father used to take Polaroid pictures of everyone to hand out. 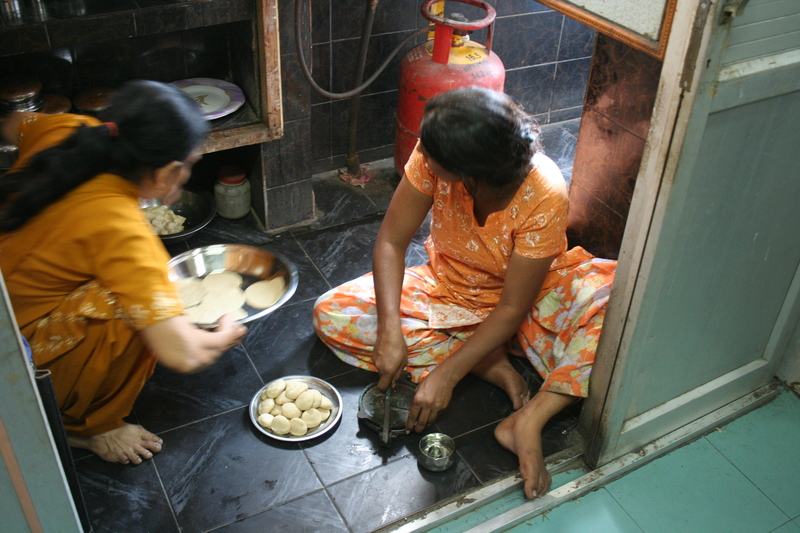 When the prayers are finished, and Dean and I have taken a turn at offering prayers, Kamlesh gets to work in the kitchen, frying up mountains of puris. 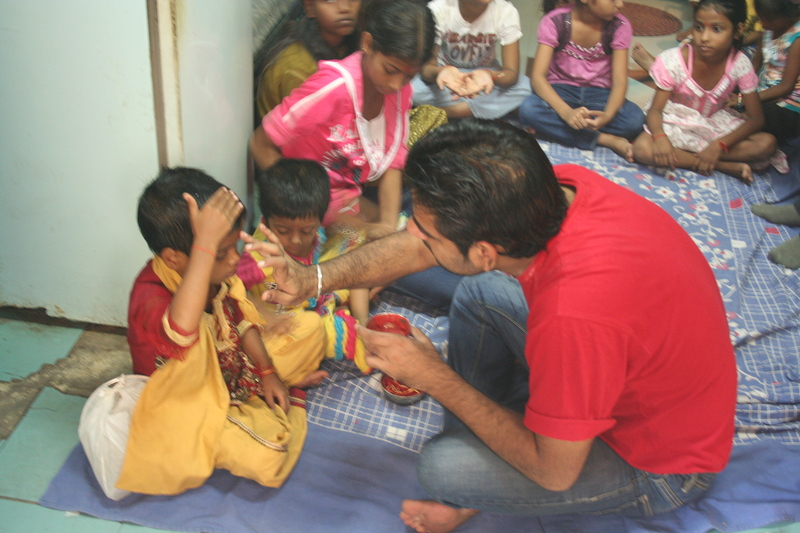 As the room fills with the smell of ghee and incense, Amit ties sacred threads round each child’s wrist. 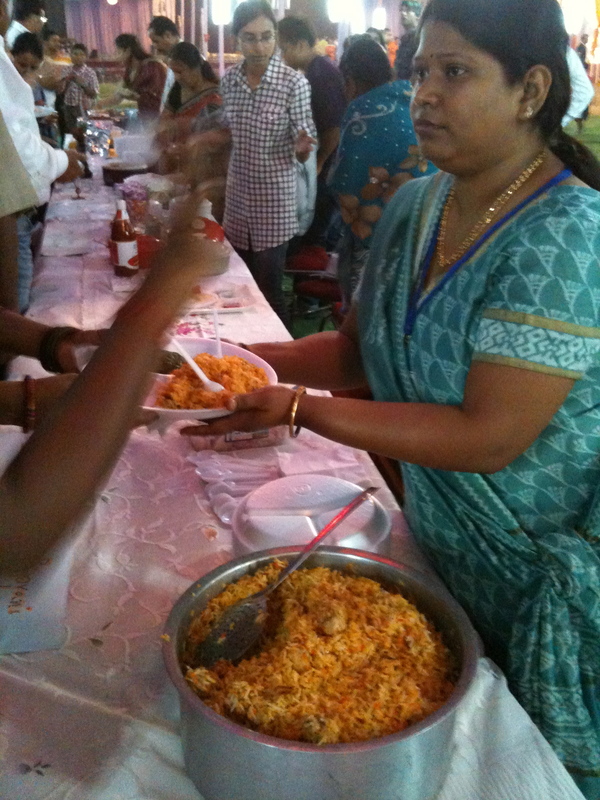 The devi are then served their food. 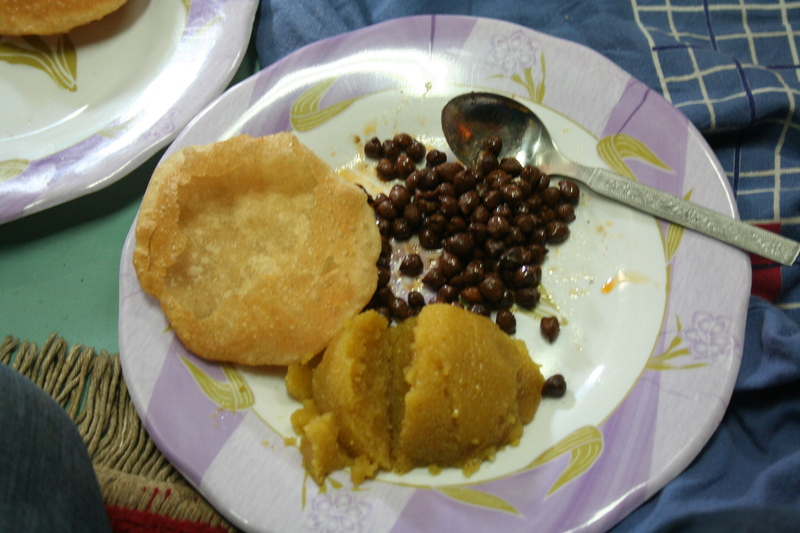 On Ashtami it’s traditional to eat chole, (spiced chick peas), sooji halwa, (semolina halwa) and freshly fried puris (puffed, deep fried bread). 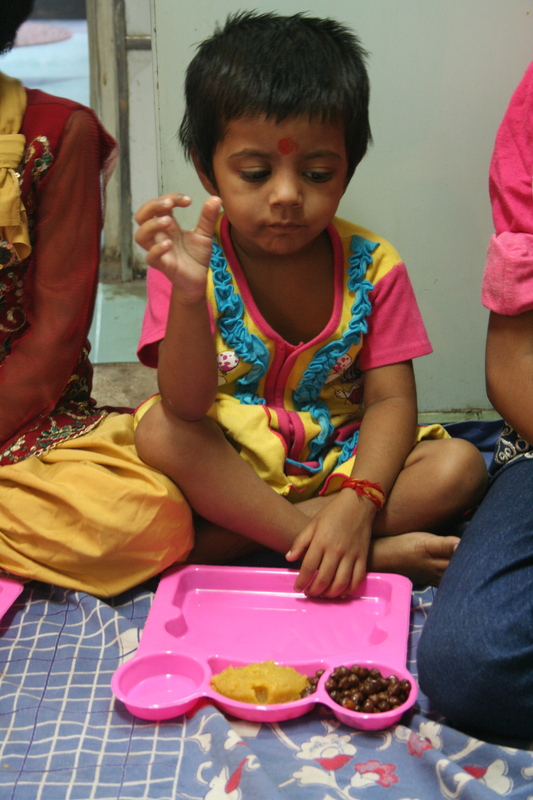 The food looks and smells wonderful but it’s our turn to be patient as we watch the devi devour their food. Soon the plates are clean and the girls revert to being a little less heavenly. Perhaps they’ve been on best behaviour too long or a sugar rush from the halwa suddenly kicks in but when they realize Amit has a stash of chocolate and crisps a stampede ensues. 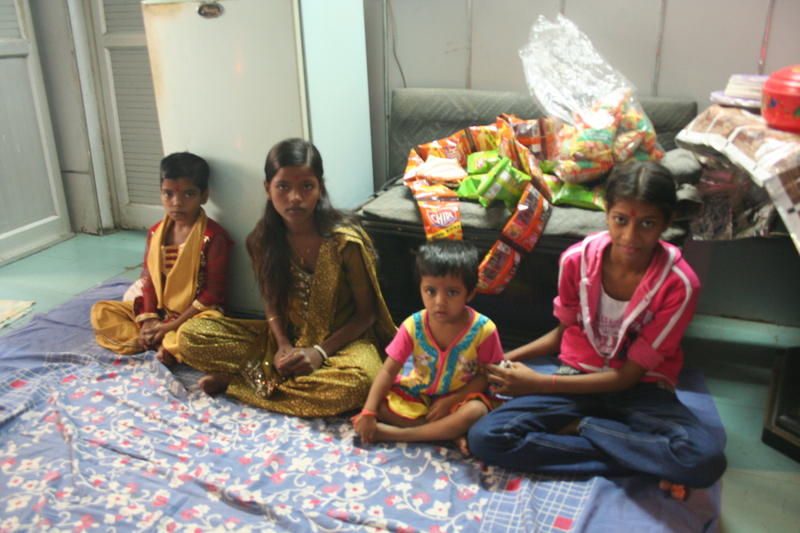 When the snack supplies and 20 rupee notes have been exhausted, the children clatter off down the stairs leaving us to savour our own plates of Ashtami food. In the Hindu calendar, this is the time of year blessings are bestowed and counted. As I walk slowly back through Sadar Bazaar, Khari Baoli and Lal Kuan I marvel for the millionth time at the great good fortune that brought me to India then led me to Old Delhi. The festival season is well under way here in Delhi and with so many celebrations overlapping and coinciding, it can be tough to keep up. I’m doing my best – for my book, I’m trying to make sure I at least catch everything in the Old Delhi calendar – but sometimes it’s hard to know what’s happening when. 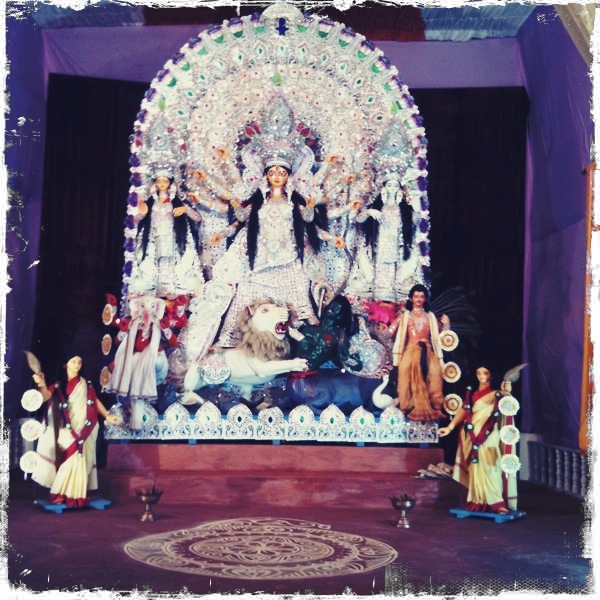 So if there’s anything you think I might miss, please drop me a line – for example I hadn’t realised that the Bengali festival of Durga Puja was celebrated in Old Delhi until new Bengali friend Surya took me in hand. It turns out the Kashmere Gate Durga Puja (also known as the Delhi Durga Puja Samiti) is in fact Delhi’s oldest, dating back to the time many Bengalis came to Delhi to work for the British when the government moved from Calcutta. 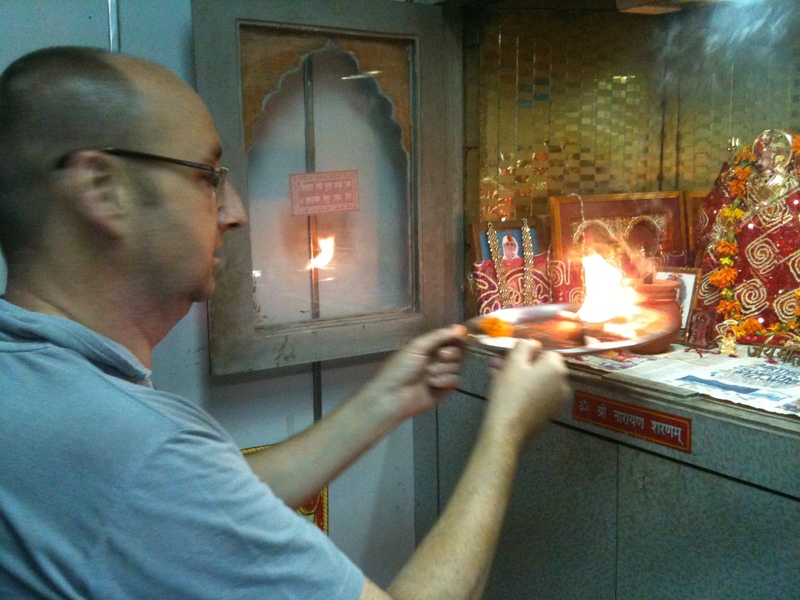 In the early days, the Puja was held in the heart of Old Delhi in Nai Sarak, then Fatehpuri. The Puja’s new home is the Bengali Secondary School on Alipur Road and last night Surya, her husband Sean and I met at Civil Lines metro to check it out. As I frequently find myself lost in Hindu traditions and rituals, Surya first of all sat me down to explain some of the Durga essentials, calling her Mum in Siliguri a couple of times for clarification. Durga Puja coincides with Navratra, which began last Wednesday, and both are linked to the start of winter and harvest time. Navratri, which literally means ‘nine nights’, a nine day fasting period for Hindus, is observed several times a year but the most significant is the Maha Navratra (‘Great Navratra’) at the beginning of autumn. The dates of Bengali festivals and pujas are determined by the annual Panjika almanac, compiled by astrologers and priests; it also determines auspicious days for weddings, business ventures etc. according to the lunar cycle. The Panjika also details how Durga, along with her children Lakshmi, Saraswati, Ganesh, and Kartik will arrive, by horse, palanquin, boat etc. If she arrives by elephant, as she did this time, it’s going to be a good year ahead. Although not such good news for her departure: she’s leaving on a palanquin, signifying epidemic. The Kashmere Gate Durga Puja is a traditional and low-key affair compared to many in Calcutta: the Goddess was radiant without being too flashy and the music was ‘Rabindro Sangeet’, the beautiful music and words written by Rabindranath Tagore; songs of ‘love and revolution’ according to Surya. Today is the start of three days of religious rituals then Durga’s earthly visit will be over for another year and she’ll go back to heaven via an immersion in the Yamuna river on Thursday. 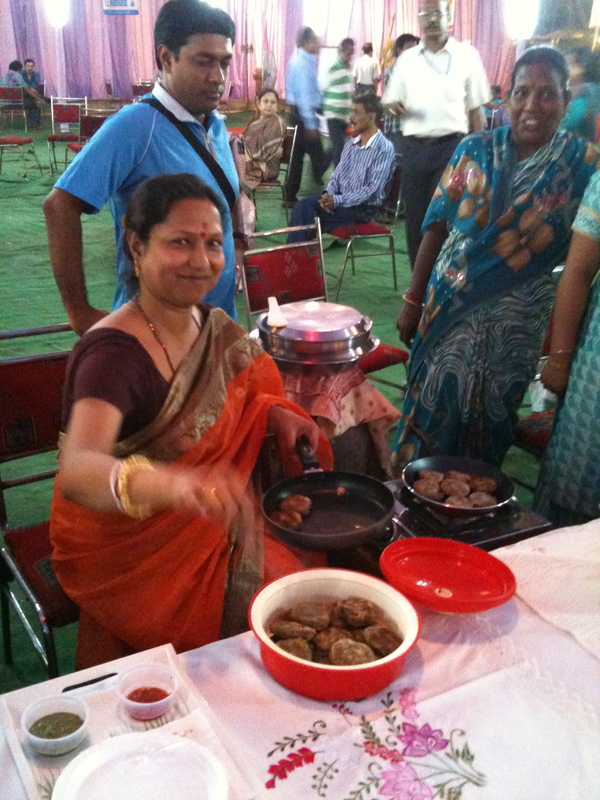 But of course I was itching to get on with the food side of the things and I had already noticed lots of women pulling stoves, pressure cookers and platters out of bags. 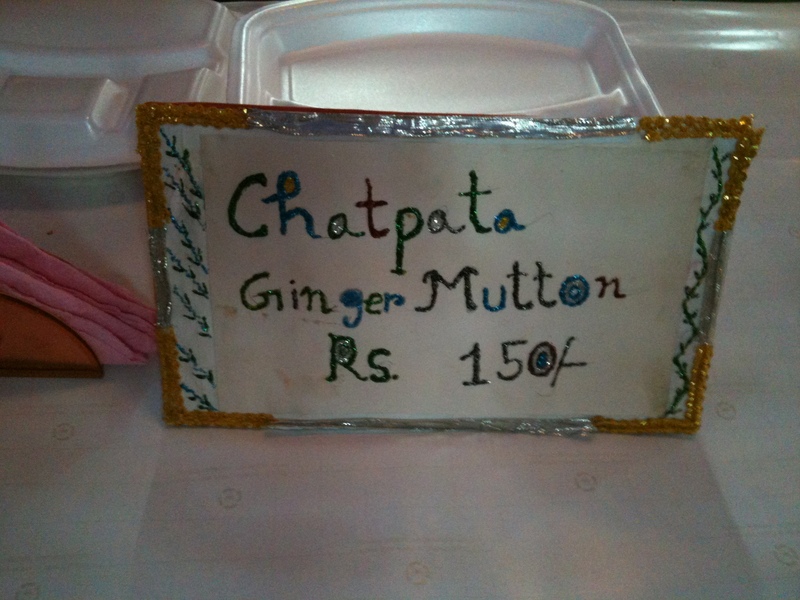 Which could only mean one thing – the Ananda Mela was about to start. 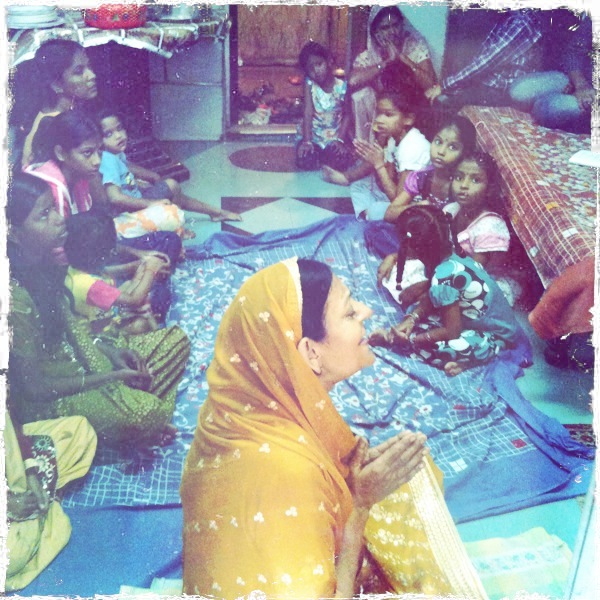 The Ananda Mela is a wonderful tradition of local women sharing their family specialities on the evening before the puja begins (which this year is today). 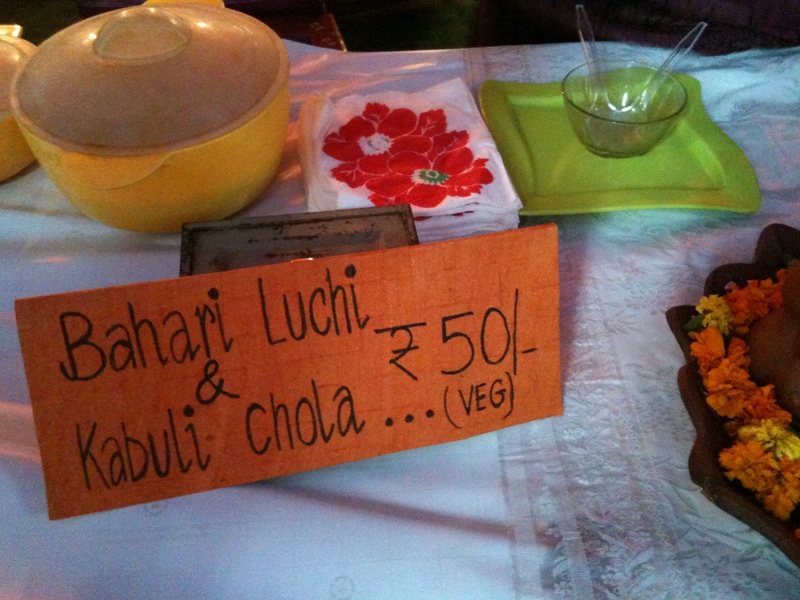 We tried almost everything on offer: Luchi Chola (chick peas with puri), Jimikand (also known as ‘kochu’ or ‘taro’) Cutlets, Chicken Biryani, Chicken Korma ‘Rashmoni’ Kheer (‘kheer surprise’), Malpua (sweet, fried fritters), and Patishapta (a sweet pancake stuffed with coconut) and the excitingly-named Bonanza Chilli Chicken with Lemon Rice. 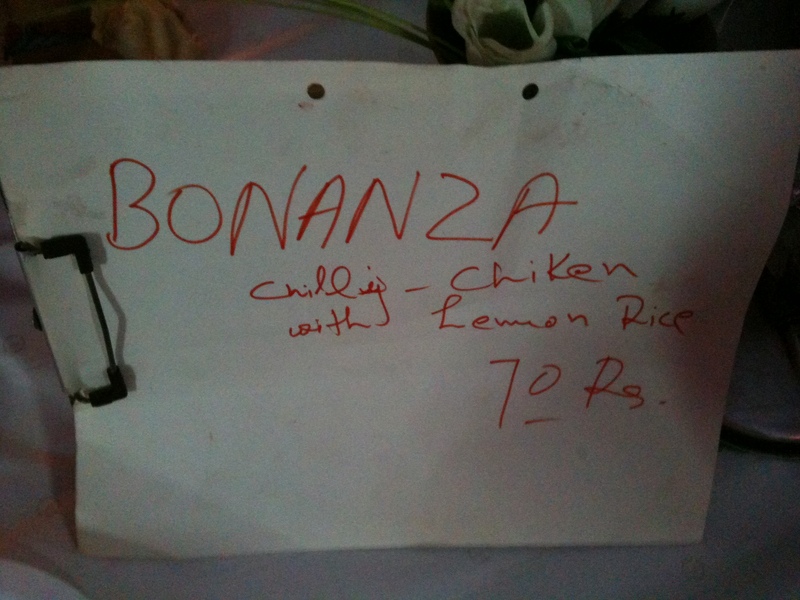 Wonderful, lovingly-cooked homestyle dishes, a grand start to the glorious Delhi eating season.